PMG Sports clients Phil Dalhausser and Nick Lucena are rocking and rolling into the summer with premier Bluetooth sports headphone brand 66 Audio. 2016 U.S. Men’s Olympic Beach Volleyball Team members Phil Dalhausser and Nick Lucena have found a headphone brand that can finally keep up with the rigorous training schedule that goes along with being an Olympic athlete. This week, the duo announced a new partnership with 66 Audio, highly regarded as the top Bluetooth headphone brand for athletes and active individuals. 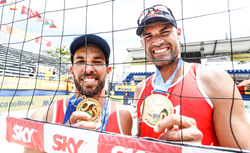 Dalhausser and Lucena have dominated the pro beach volleyball circuit since teaming up in mid-August of last year. They’ve taken home an impressive 6 FIVB Gold Medals against the world’s top teams and are positioned as a leading contender to win the Gold Medal on Copacabana Beach next month. This new partnership with 66 Audio marks an exciting time for the duo as they gear up for Rio with industry-leading brands. 66 Audio was voted the Best Bluetooth Headphone of 2015 by Men’s Fitness Magazine and have continued to enhance their wireless audio products built specifically for athletes and active consumers. With industry leading innovations in sound, technology and design, the LA-based startup is constantly pushing the envelope. Whether you’re on the beach challenging at the net like Phil and Nick, training in the gym or just going for a run, these headphones have been designed to keep up with any active lifestyle. PMG Sports is an elite sports marketing agency with a goal to create a space in the industry that is completely unique through superior creativity and innovation. PMG Sports has set out to provide each of its clients with the same level of professional representation and service. Additionally, PMG Sports is an industry leader in providing corporate consulting services and treats each client, whether an athlete or corporation, with an added personal touch. For more information, visit our website at http://www.pmgsports.com.